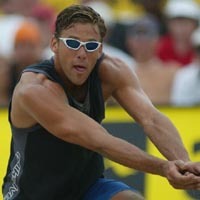 LeGrande (La-GRAND) who earned $20,500 in 2001 with eight top nine finishes in eight events, won back-to-back AVP titles with Brent Doble in Muskegon and Belmar in 2001. He and Doble also won the 2000 AVP season opener in Delray Beach, Fla. LeGrande also captured the 2000 Santa Barbara stop with Franco Neto. He teamed with Wayne Seligson for two seasons on the South African beach tour (1994-95) where they won three titles. LeGrande, who participated in volleyball and soccer at Honolulu Punahou High School, graduated with a degree in Liberal Arts and Education from Pepperdine in 1994. LeGrande played on Pepperdine�s 1992 NCAA championship volleyball team. He currently is a substitute teacher in the Santa Monica, Malibu and Honolulu school districts. LeGrande enjoys golfing, sushi, a great book, surfing and being with nature.